South African Sign Language (SASL) will soon be offered as a school subject to Grade 0–12 learners in all 42 schools for the deaf in South Africa. Our Department of South African Sign Language had a role to play in this significant development that will empower deaf learners in South Africa and the continent. Dr Philemon Akach, Head of the Department of South African Sign Language at the UFS, is part of the nine-member task team that recently handed over the SASL curriculum to the Minister of Basic Education, Angie Motshekga. The curriculum will be offered as a home language in all schools from 2014 and Grade 12 learners will be able to write it as a final-year examination subject. 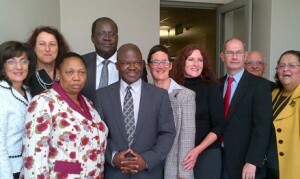 Dr Akach – a member of the task team since 2009 – helped to coordinate the development of the curriculum. Image: Minister Angie Motshekga (front left) joined by members of the South African Sign Language task team. Behind Minister Motshekga’s shoulder is Dr Philemon Akach.